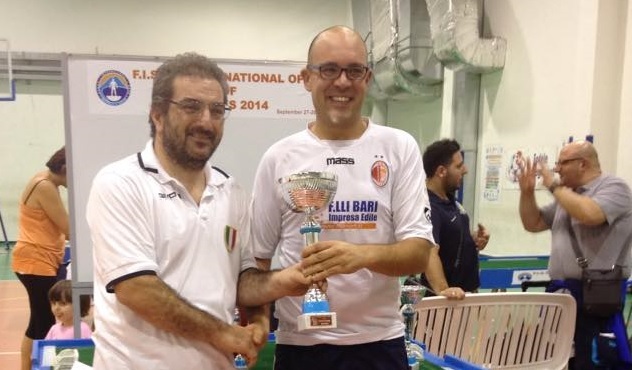 The first international Open of the season was held last week-end in Naples, one of the hot places of international subbuteo, in the South of Italy. The team event had a brilliant field of 21 entries and the level was very high. In the final, Reggio Emilia beat Perugia thanks to a positive goal difference while the game ended on 2-2. The winning team was fielding Licheri, Flores, Bari and Lamberti. The individual tournament was also very open but despite of the presence of many top Italian players, the final was a Spajnish story and Carlos Flores finally defeated the new world champion Juan Noguera by an amazing score of 8-3. The other winners were Marco Lamberti (veterans), Sara Guercia (ladies), Riccio (U12), Vezzuto (U15) and Ciccarelli (U19). This entry was posted in FISTF News and tagged Germany, Italy, Results. Bookmark the permalink.